Olde Good Things has been busy salvaging, repurposing, and designing spectacular living spaces using some of the incredible pieces we’ve unearthed from old buildings and scrap heaps. Not only do we salvage architectural treasures and design incredible magazine feature worthy décor, we also go out of our way to work with innovative architects who have an eye for visually stunning exterior design. 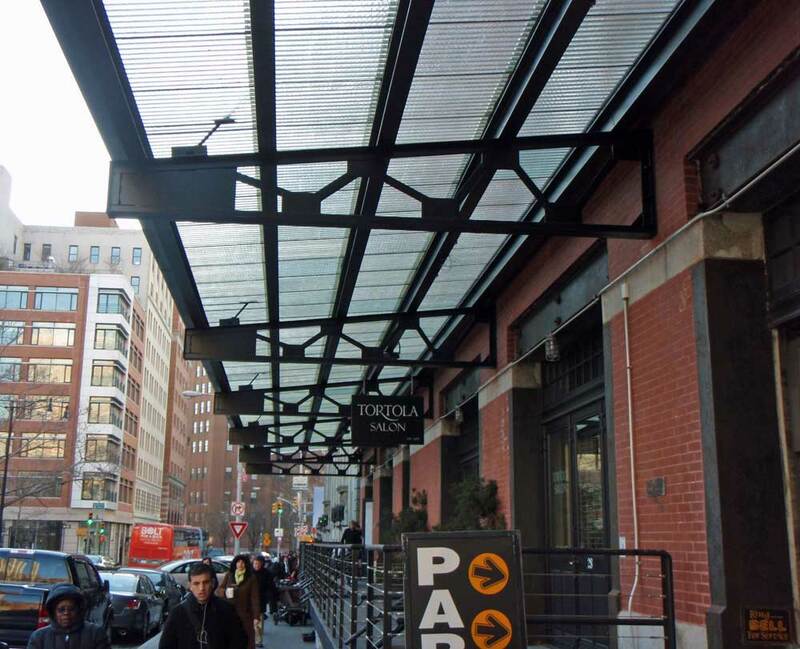 For an outstanding example of our partnership with skilled architects and reusing reclaimed architectural materials, look no further than these glass-and-steel canopies constructed in SoHo, New York City. 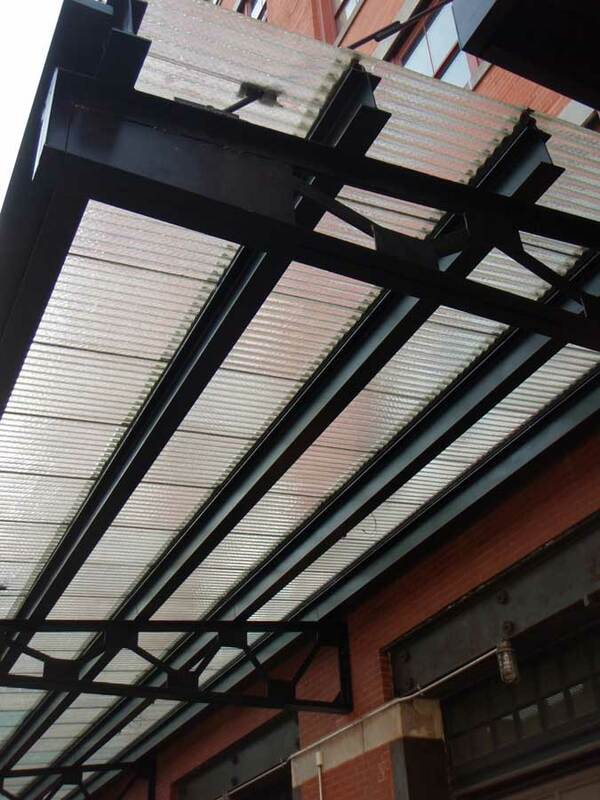 The glass, carefully salvaged by the Architecturologists, is corrugated, embedded with chicken wire, tough as nails, and great looking. The corrugated glass is stronger and is designed to catch and defuse the sunlight in a brilliant way. How did this stunning showpiece come to fruition? Well, we salvaged, the architects designed, and a skilled contractor installed. Voila! Art and ‘architecturology’ combined! 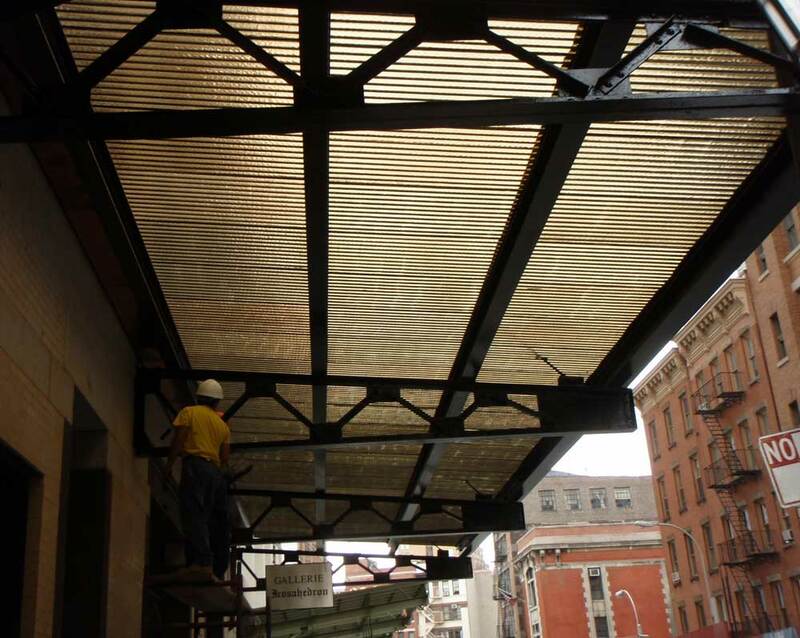 One of the canopies uses amber-colored glass, and the other (on the other side of the building), uses clear glass. Unfortunately, this glass is no longer manufactured, which means that once our supply is gone, it’s gone – another beautiful piece of architectural treasure lost forever to time. If you’d like to own your own piece of this incredible glass before our salvaged collection disappears, contact us or visit one of our stores. We can provide cutting and drilling to specifications for your projects. If you’d like to see other projects designed and completed by the architects, visit their website, Bone/Levine Architects. For more creative uses of reclaimed glass, see oldegoodglass.com.